Let’s discuss how the perfect React JS developer resume should look like, what skills and experience it has to contain and how to hire a React JS developer. A front end developer with over 5 years of experience. Worked on projects with ReactJS for at least six months. Thorough understanding of Flux Architecture. Strong HTML5 skills, usage of hooks in XHTML. Understanding of CSS/CSS3, CSS Pre-processors & PostCSS. Principles of responsiveness and have at least 5 successful responsive solutions in portfolio. UI should meet the design requirements. Worked with data structure libraries. Perfect communication skills (verbal and written), eager to learn new technologies. Familiarity with RESTful APIs and modern authorization mechanisms. 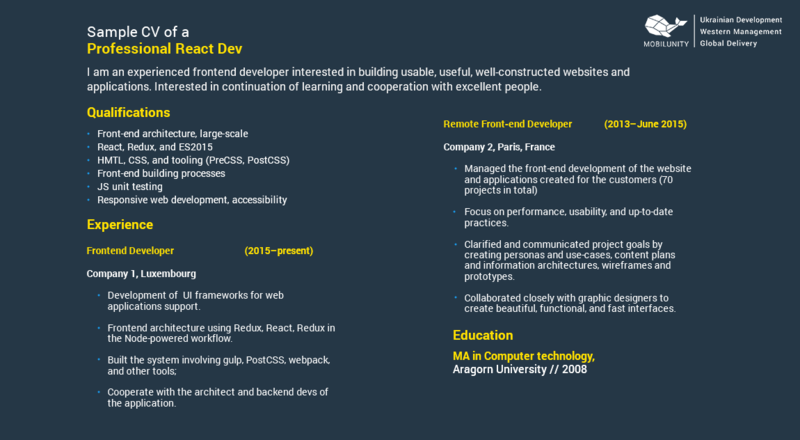 After reviewing and approving such a good professional React developer resume you would want to invite your candidate to the interview. Here are some interview questions you would want to ask your potential employee. How long have you been using ReactJS? What is React and why is it useful? What are the disadvantages and limitations of React? What features/functionalities of React have you used most often, and which ones haven’t you used? Having a good React developer CV is not enough. Let’s move to the test task. Here are the simple samples of the task you could ask your candidate to accomplish during your technical interview. This task will test the developer’s technical independence, as this is typically done by technical leads in large teams. This task should be easy to complete and shouldn’t take more than an hour for skilled developers. So now, you are ready to check the actual ReactJS developer resume samples and evaluate them following our guidelines above. We know all these details as our company helps clients from all parts of the world to extend their development teams and provides dedicated developers of any stack and level. Our team is constantly progressing towards better-developed future and more sophisticated web services. Soon, we will have a need to begin cooperation with new developers and new clients. All our teams and developers will be at your disposal for as much long as you need it. Each service provided by us must be outstanding. Don’t hesitate to check our pipeline of developers and choose the one or several you are looking for!